Speaking of algae oil, we’ve almost completely replaced the olive oil in our cooking with Thrive Algae Oil. If you’ve never tried algae oil, you’re probably wondering if it tastes like seaweed. I assure you it doesn’t – it doesn’t even come from the sea! Thrive algae were originally sourced from the sap of a chestnut tree. I love its light, neutral taste that lets the flavors of our food shine through. It has a high smoke point of 485° Fahrenheit, which means it won’t burn at high temperatures. This is key for frying and sautéing foods. It even holds up when roasting dishes in the oven. Thrive Algae Oil contains 90% monounsaturated fatty acids (MUFAs), as compared to 70% in olive oil. Consuming foods with high levels of these fats has been shown to reduce the risk of heart disease. Thrive Algae Oil also has the lowest percentage of saturated fat of any cooking oil. 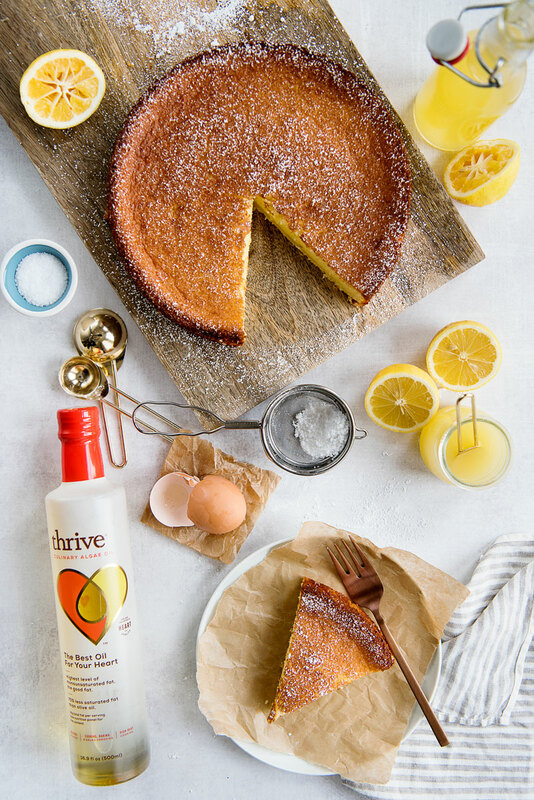 Surprisingly though, one of my favorite uses for Thrive Algae Oil is in baking! 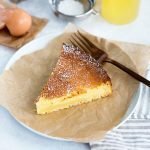 It’s absolutely incredible in this light and fluffy lemon cake. Infusing the oil with Meyer lemon gives it this bright citrus taste that can’t be beaten. You can find Thrive Algae Oil on their website and also buy it on Amazon. If you think I’m the only one who has converted to algae oil, check out the 200+ glowing five-star reviews at the bottom of the page. If you’re as obsessed with Costco as I am, Thrive Algae Oil will be available in the Novato Costco in April. Be sure to stop in for in-store demos, and to buy a bottle for your kitchen! A few notes about the cake. Do yourself a favor and splurge on high-quality eggs. 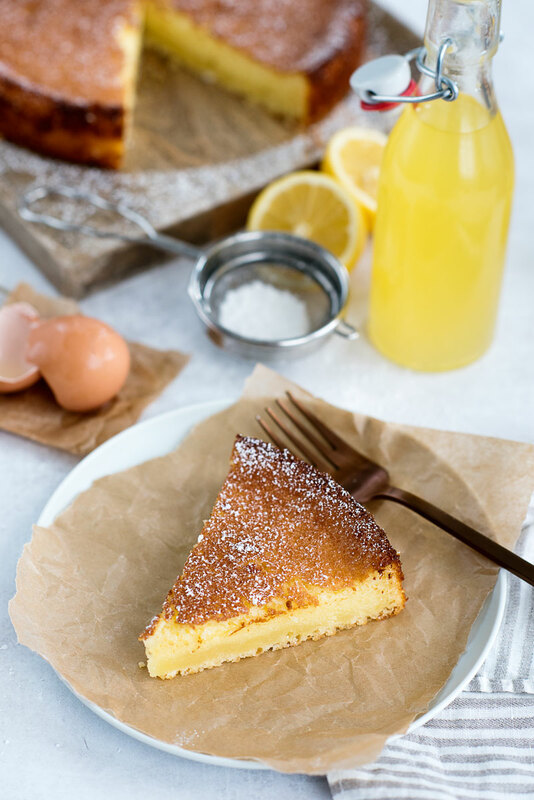 Those beautiful golden-yellow yolks of good eggs are what will give your cake this pretty lemony color. 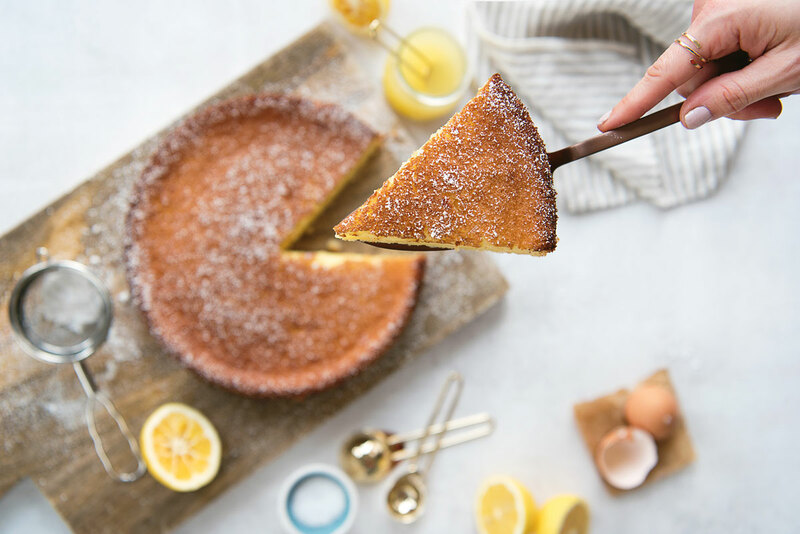 Unlike lemon zest, using infused oil to make the cake ensures a consistently strong, but not-too-strong, lemon flavor throughout the cake. 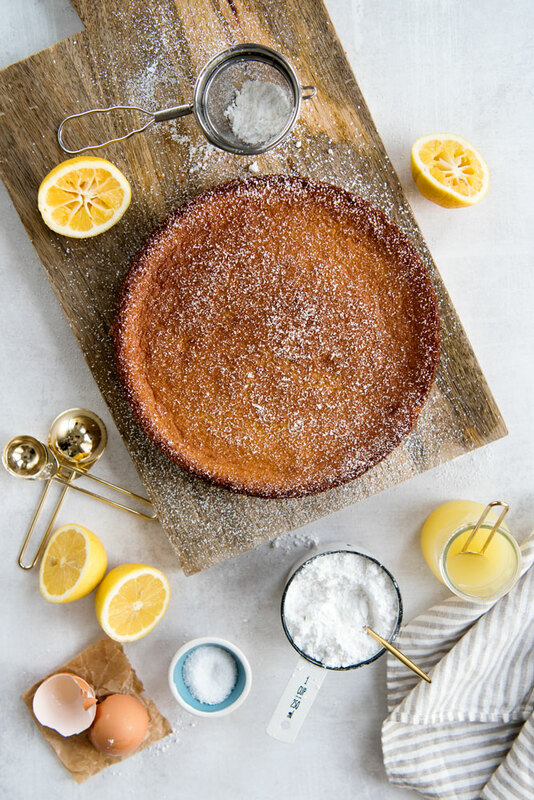 A light and airy lemon cake recipe made with Meyer lemon infused algae oil. Algae oil has healthy fats and is great for everything from roasting to baking. In a small bowl, stir together the infused oil, lemon juice, and vanilla extract. Set aside. In a separate small bowl, whisk together the cake flour, baking powder, and salt. Set aside. Remove the mixer bowl and stir in the dry ingredients gently by hand. Make sure to break up any lumps, but do not over mix. The batter will be airy and foamy. Pour mixture into prepared springform pan. Bake for 45 minutes. The cake will be golden brown when finished. Cool in pan for 10 minutes, then run a sharp knife around the edge to loosen and unhook. Let cool completely on a wire rack with the metal bottom still on. Dust with powdered sugar. Slice and serve. The cake will keep in an airtight container at room temperature for up to a week. 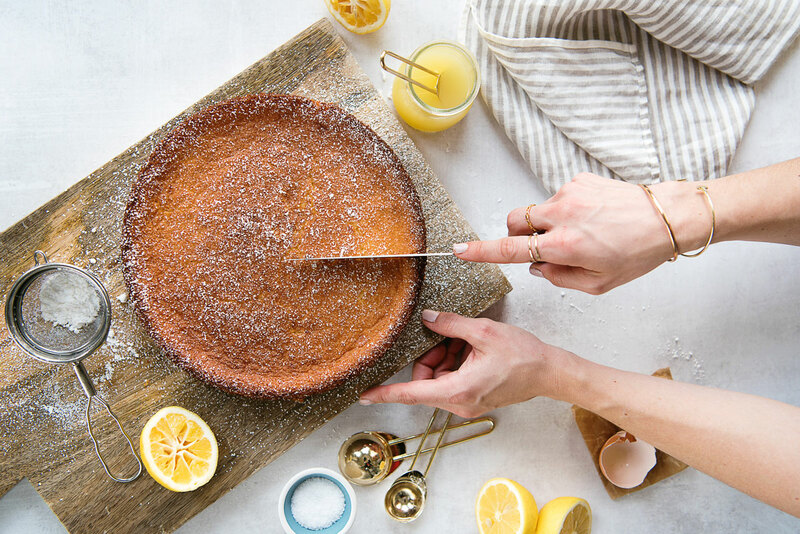 Just wait to cover with powdered sugar until you are ready to eat. Traditional lemons will work for infused olive or algae oil if you can’t get your hands on Meyer lemons. You can also swap out all purpose flour for the cake flour but the cake won’t be quite as light and fluffy. 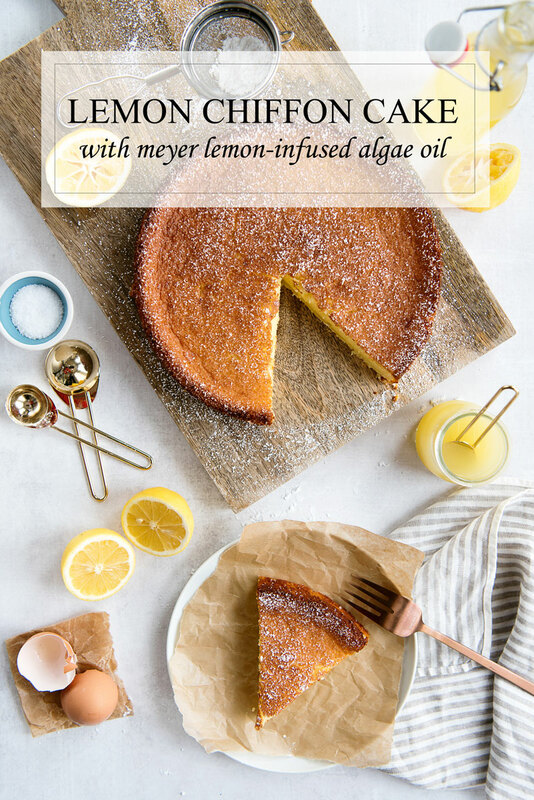 Thanks so much to Thrive Algae Oil for partnering with me to share this easy lemon-infused recipe! Wondering why I do sponsored posts? Read more here. This looks amazing! I want a cup and tea and a couple slices of this cake! I’ve never heard of algae oil, but I know that this cake looks awesome!! I’m envious of your Meyer lemon tree! What a wonderful idea to make lemon olive oil from some of the fruit. I’ve never heard of Algae oil and I’m glad it doesn’t taste like seaweed. I’ll have to try it sometime, and this cake too. Looks fantastic! Oh my! Looks and sounds amazing! Definitely need to try this oil!